Set designer Tony Walton has worked on everything from the plays of John Guare and Anton Chekhov to the musicals of Stephen Schwartz and Stephen Sondheim — not to mention such iconic films as Murder on the Orient Express and All That Jazz — amassing shelves of awards in the process. Now the self-described “ancient geezer” is back on Broadway as designer of the musical version of Charles Dickens’ A Tale of Two Cities at the Al Hirschfeld Theatre. Recently, Walton took a break from working on this massive show — which consists of nearly 50 scene changes — to sit down and discuss the project. THEATERMANIA: How did you go about adapting such a massive text and make it visually accessible? TONY WALTON: It’s a staggering amount of physical environment that we have to achieve. It obviously couldn’t be done in a traditional way with the set storing in the wings, because we’d be waiting for those scene changes all the time. So we tried to come up with a creation that could be a cohesive series of units that could break apart and come on in bits and pieces that are separate but all connect to make one complete Bastille. I also thought it would be interesting to see if we could find a Shakespearean energy to the presentation. Then, I discovered almost by accident that the Globe Theater and the Bastille have an almost identical skeleton. So I figured out the skeleton for each of them and then smushed them together. TM: Can you explain to me the process of smushing? TM: These two cities in the play, London and Paris, are known for their architecture. How do you manage to honor that on the stage? TW: The problem was less to do with honoring it than making it clear which city we were in because we moved a lot from one country or one city to another. I said we’ve got to do something very simplistic. Let’s make Paris red on account of the revolution and London blue. So from the basic wash of color, we know where we are at any given moment. TM: Is it daunting to approach such a well-known piece of literature? TW: It is, but that’s also so exciting. If ever I’m spoiled enough to be able to select what I’m working on, I try to get something that’s as different as possible from what I’ve been doing before or what I’ve ever done before. TM: How will this show avoid the inevitable comparisons of Les Miserables? TW: I’m not sure it can avoid it. 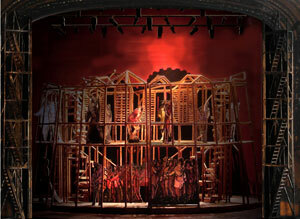 The physical swirl of Les Miserables was very much built on the giant turntable. So even though all the scene changes were an obvious invitation to use a giant table, we just thought we can’t do that. Also, we need something that doesn’t feel mechanical, that feels like the company itself created it. TM: On a different note, you’re planning to direct a new version of the musical Busker Alley on Broadway. How is it different than the previous version, which never made it past its out-of-town tryout? TW: It’s a very different animal than the one that starred Tommy Tune. It’s basically the anti-Broadway musical musical, because with the exception of one number, which is the legitimate number done inside the theater, it’s all street entertainment. The version that we did with Tommy Tune was very slick entertainment. TM: Do you think audiences will respond with great enthusiasm to Busker Alley? TW: It would be impossibly cheeky of me to imagine that. I just think that if you love it enough yourself, somebody else will love it too.